How I Met Your Mother concluded after 9 seasons last night with its all-time most-watched episode. And all those extra fans were, shall we say, not thrilled with the serpentine narration’s final twist. In an episode that provoked a text message from one of EarnThis’s founders that simply stated this post’s title, Ted Mosby’s wife (whom we took 8 seasons to meet) was revealed to be dead by the time he’s telling his kids the story. The woman Ted truly ends up with? None other than Robin–who would have been the prohibitive favorite for the role all along had she not been supposedly rejected for it in the pilot. Has any other show tried to have its cake and eat it, too, quite like this? Up until now, the most baffling aspect of the later seasons of HIMYM was the refusal to let Ted get over Robin. As I wrote earlier this year, “If Robin was never going to be the endgame, why, why, why did Ted spend all of seasons 7 and 8 pining for her?” Well, I guess we have an answer to that question. And thus, for a show centered around Ted, HIMYM ultimately bore a lot of resemblance to Barney—after all, this entire series now boils down to an astonishing inability to commit. Despite giving us a love-drunk protagonist, HIMYM brought that stereotype back, more prominent than ever. And in the process, they undoubtedly wanted to have their cake and eat it, too. They got significant mileage out of the teasing hints of the early seasons, when they tantalized us with clues about the mother, since we knew—knew!—that Ted’s endgame was with someone not in the main cast. Yet, they couldn’t deny the great chemistry of Ted and Robin that caused a significant portion of fans to hope they could end up together. And when it came down to pick between our titular character and Robin for Ted’s soulmate, they chose…both. Firstly, this shouldn’t change the legacy or overall perception of the show. 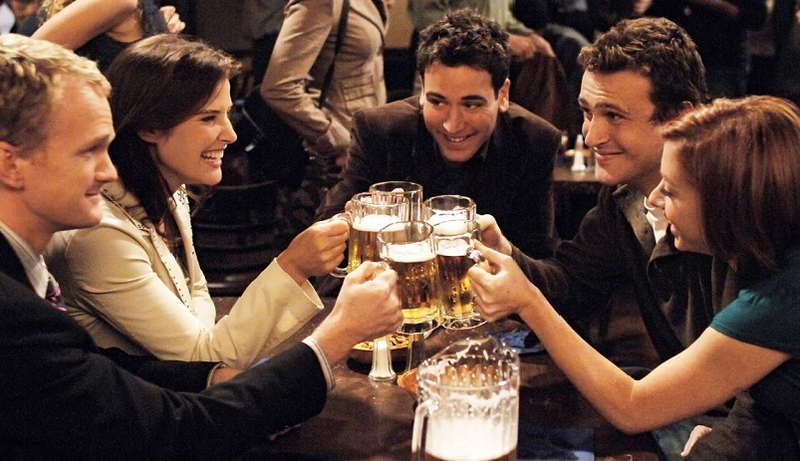 There’s still more insight into friendships and relationships in a single early HIMYM episode than, say, the entire catalogue of Girls (a lot more fun, too). Before last night, I knew the first half of HIMYM’s oeuvre was great, and the second largely forgettable, and nothing would affect that. Watching the show this season felt like talking to an ex-girlfriend you no longer had feelings for—you might be a little curious to see what she was up to, but you had more pressing things to worry about. Don’t get me wrong—this was a clunky finale whose vertiginous time jumps shortchanged notable emotional moments. But my resignation (and my longstanding belief that Robin was best for Ted anyway) leaves me less outraged and more curious about the writers’ mindset. Obviously, no one knew how long the show was going to last when it premiered. The writers had contingency-mother plans in the case of an early cancellation (i.e., Victoria in Season 1). There’s no chance in Hell that ‘The mother is dead by 2030’ was part of the initial plan. Yet Ted and Robin’s sparks were sufficiently electric to force a mulligan on that unfortunate “Aunt Robin” thing. As the episode progressed, it wasn’t hard to see this coming. Barney and Robin’s marriage was crumbling rapidly. Robin was lamenting those lost feelings for Ted and running around being cute with his daughter. Tracy (in her wedding gown! At McLaren’s!) took a picture of the gang from which she was conspicuously absent. Even the fact that Ted and Tracy didn’t marry for 7 years seemed to offer a hint as their impermanence. In addition, the entire last few seasons (with those seemingly-unnecessary Ted/Robin moments) really had been building up to this. Of course, my frustration with their incessant agonizing over each other stemmed from my belief that they were done as a relevant couple. Many fans have said that this finale has tarnished their feelings about the early episodes; but at the very least, it makes me forgive everything with T+R in seasons 7 and 8. I won’t open up a separate can of worms, but I think movies, with their finite and pre-ordained endpoints, lend themselves to better drama than TV shows. The uncertainty over a TV show’s’ completion date (not to mention the fact that the degree of difficulty rises with the number of hours of story time) renders potent drama devilishly difficult. For example, if you experience a powerful dramatic reaction to something in an episode of TV, that’s great—until it’s modified, nullified, distorted, or reversed by subsequent episodes and later developments. HIMYM was constantly on the cancellation bubble early on, and everyone knows it should have lasted only four or five seasons if revenue wasn’t a factor. If HIMYM’s creators had known the endpoint from Day One, they might have given us four or five of the best sitcom seasons ever. But while the later seasons certainly could have been better, it’s a lot harder to write 70 compelling hours of entertainment than the 2 of a self-contained movie. Ultimately, HIMYM—from a purely dramatic standpoint—came down to a single dichotomy. The writers gave Ted his soulmate from the get-go. Unfortunately, feeling boxed in by their show’s structure and title and one line in the pilot, they just couldn’t come up with the right way for the soulmate to check off every single box, namely that of ‘Mother.’ Trying to reconcile those two concepts simply proved too difficult a task. I haven’t seen the later seasons of the show, but I like your take on the final twist. Well, they recorded the scene of the kids back in 2005 or 2006, probably during Season 2. So, maybe not INITIAL plan, but this has been the planned endgame for 7+ years, almost all of the show’s run. Also, here’s the daughter now. Yeah, they knew the endgame from pretty early on* – but not when they sat down to write the pilot, that’s all I meant. * Which actually is really interesting, if you think about it. They KNEW for years that the mother was going to die. I’m even more convinced that if this had ended after 4 or so seasons and was handled a little more smoothly (without people getting tired of Ted/Robin going into Ross & Rachel territory), it could have been a great way to turn convention on its head. Such a shame that Lyndsy Fonseca grew up to be so unattractive…. I finally got to the series finale in my re-watch with Katy, and the rest of my thoughts will be in a review of Season 9 I hope to put together some time this week. But I agree with your general notion — it was an ungraceful but curious ending, totally having its cake and eating it too. Kind of fascinating, actually, the way it played out, and I agree that they gave a lot of legitimacy to the previous three seasons of Robin-pining. Also… were people really THAT surprised? Did they not see the constant foreshadowing?